I do not like military shooters and tend to avoid them like the plague. A lot of them are morally awkward, featuring mostly white Westerners shooting at whichever group of ‘others’ seemed the most threatening at the time the game went into production. Also, the online-multiplayer seems to be the main selling point for most of these games, and I don’t enjoy getting continuously ‘fragged’ or ‘pwned’ by foulmouthed teens who have spent all their time online practicing instead of developing social skills or getting laid. 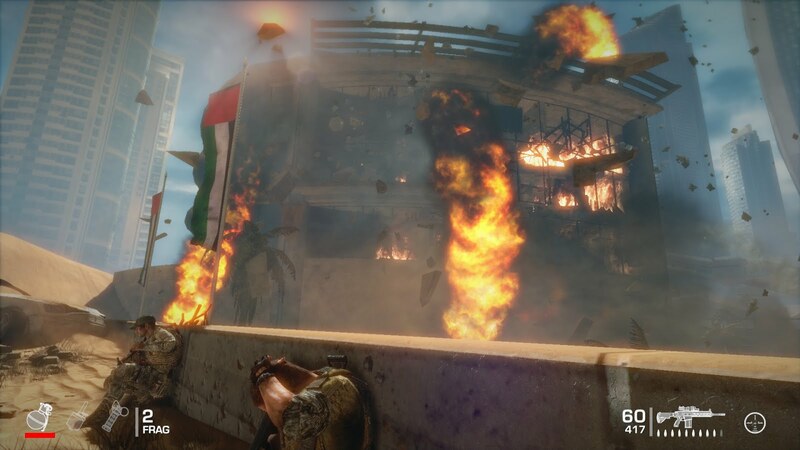 And finally: realistic shooters tend to bore me with their machismo and rabid patriotism. 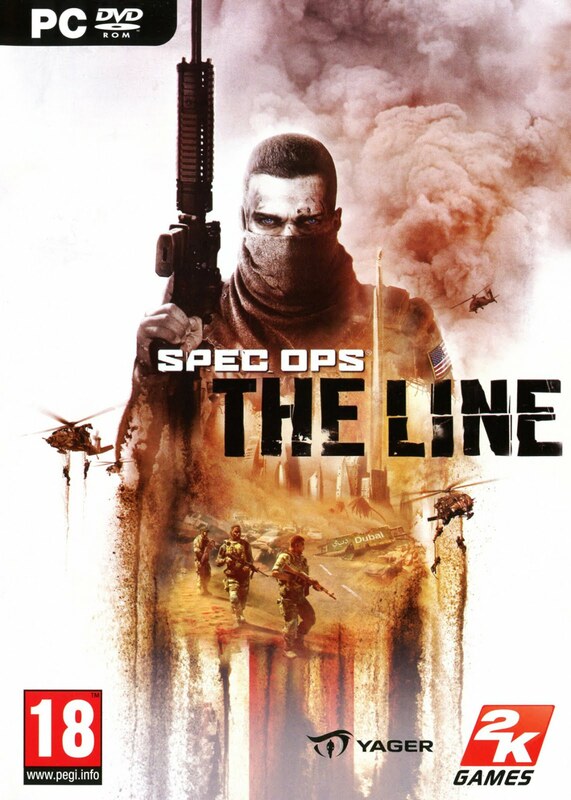 But then along came Spec Ops: The Line. 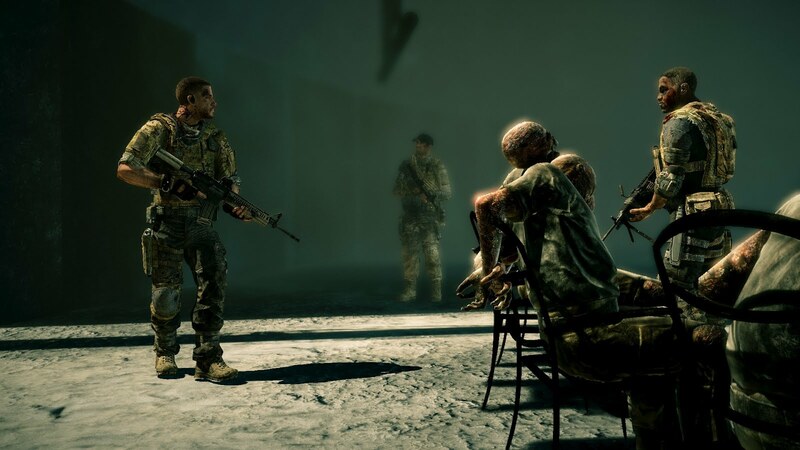 It’s a military shooter, but it gathered so much buzz for its unconventional storyline that I decided to pick it up when I spotted it on sale. You are Captain Martin Walker, a guy who at first seems like a cookie-cutter all-American hero. 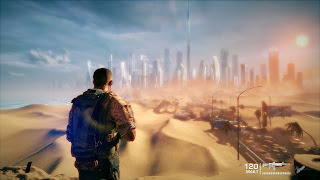 You lead a squad of three into Dubai, which has been hit catastrophically by sandstorms. Your job is to covertly find out what happened to a previous team – the 33rd battalion led by a certain John Konrad. It was sent to Dubai to evacuate the inhabitants that were left behind after the rich and powerful had fled the city. As you walk into an unclear situation with multiple factions fighting each other, mistakes are made which escalate the situation, including one as harrowing as I’ve ever witnessed in a video game. Walker’s mind and body take a severe beating and his team begins to doubt him. Depending on what you do during the final mission and the sequence that follows after the credits, it leads to one of four downbeat, existential endings. None of them include bunnies, rainbows or unicorns. Despite this, all of them are worth watching and profound in their own way. Having been pre-warned by reviews that the parts where you shoot a literally unbelievable amount of opposing soldiers are fairly generic and turn into a slog near the end, I played through the game on ‘easy’. I can actually recommend doing that, if – like me – you just want to optimally experience the story (‘enjoy’ seems the wrong word). It improves the pacing as you won’t have to replay any of the lengthy and increasingly grim battles more than once. From a gameplay perspective, the actual shooting is indeed pretty standard apart from a mechanic where you can shoot glass that has sand on or behind it, to pour an avalanche over your enemies. Some people have complained about the fact that vaulting and melee combat were mapped to the same button, but I wasn’t hindered by this too much, engaging long-distance by preference. Dodging hand grenades is a pain, however, because sticking to cover, getting out of cover and running are all controlled by the same button. So if someone lobs a grenade at you, you have to carefully un-stick yourself and amble away from your cover far enough for you start running when you press that button again, instead of going right back into cover and getting blown up. The game has been criticized for being hypocritical, discussing the horrors of war, while at the same time trying to entertain by way of gunfights. But the context of the shooting matters. Odd as it is, you feel somewhat guilty as you go through these sequences, but compelled to keep going because you want to see what happens next. And yes, there is heroic rock music playing on the background at points, which is obnoxious if taken at face value, but which contextually is clearly ironic, along the lines of that ‘America, f*ck yeah!’ song from the South Park guys. The gore may be entertaining to some people (and in some other games it is to me too), but here it mostly feels painful. The faces of the soldiers you kill are generally detailed enough that they become individuals when lying dead on the ground. At some point you hear a couple of guards having a very normal, humanizing conversation, right before you inevitably have to kill them. 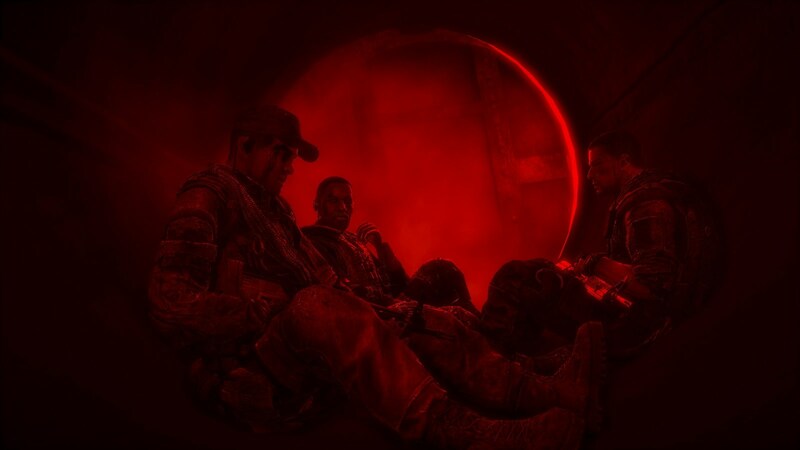 If you’re not engaging with the game intellectually, all you’ll see is a bland shooter. And you’d be missing the point entirely. In a strange way, it would be less fitting if the killing was very creative and a lot of ‘fun’. Admittedly, the fact that you can get ‘achievements’ for certain kinds of kills is a bit dubious, but to avoid a financial loss with expensive-to-make games like this, you have to please gamers of all kinds, not just the ones with a philosophical bent. So, yeah, the game does make a few concessions that slightly weaken its point. Though some of the things you will see in Spec Ops: The Line are hard to watch, the graphics themselves are impressive and the sand swept environments are outright beautiful at times. For the atmosphere, the visuals and the story, I really recommend picking up the game if you catch it on sale. Run through it over the course of an afternoon on ‘easy’ to get the most out of it (and forget about the allegedly mediocre, tacked-on multiplayer component, which I ignored). Of course, alternatively you could just look up the cut scenes on YouTube. But when taken out of context and without the interactive element, I don’t think these scenes would have the same impact. To feel that, you have to identify with Walker, at least up to a point, and feel responsible for his actions. It’s not often that a war game lets itself get inspired by something as thoughtful as Joseph Conrad’s Heart of Darkness. (Note that the name of the ambiguous leader of the 33th battalion is Konrad.) If you’re a gamer on the look-out for something with substance, don’t miss out on this experience. Even – or maybe especially – if you normally hate military shooters.